The emotional tale of a young boy who makes friend with two orphan bear cubs in the Andes and grows up with them. This is, probably, the best rendering of the stories I have ever watched as a young boy. It intrigued me so that I still watch the reruns whenever it airs on television. 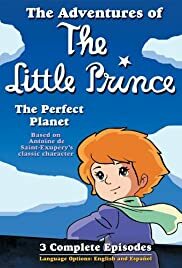 Not only is it "Old School" Japanese animation, it's based on the fascinating story by Antoine de Saint-Exupéry! Certainly a trip down memory lane!